MOSCOW, Russia -- troops surrounded their main stronghold of Donetsk, and a reported attempt by Russia to send in an armored aid convoy spurred warnings from Kiev, Britain and the United States. Journalists photograph the crater left by a shell that damaged a house in the eastern Ukrainian town of Shakhtarsk. The military-escorted convoy said to be carrying humanitarian assistance for the Russian-speaking inhabitants of Donetsk and Luhansk, the rebels’ other besieged redoubt, “would be unjustified and illegal” without the consent of the Ukrainian government in Kiev, a statement from British Prime Minister David Cameron’s office warned Moscow. President Obama discussed with Cameron and German Chancellor Angela Merkel the sharpening tension in the separatist-controlled regions of eastern Ukraine. The high-level diplomacy signaled that the international community is increasingly wary of Russian leaders’ insistence that a relief effort be mounted to help civilians trapped in the two cities as the battle for their control culminates. Alexander Zakharchenko, who on Thursday took over as prime minister of the separatists’ self-proclaimed People's Republic of Donetsk, said that civilians had been killed and injured in overnight shelling by Ukrainian government troops and that the toll would rise dramatically if the assault was not halted. “We are ready for a cease-fire to prevent an increasing humanitarian catastrophe in Donetsk,” Zakharchenko said, according to Russian news reports. He said that water and electricity were scarce in the city that until four months ago was home to a million people and that food and medicine were also running out after weeks of being cut off from normal commerce. Luhansk has been severely short on water and electricity and communications have been limited for weeks, and more than half of its 465,000 residents have fled, most across the border to Russia. There was no immediate response from the government in Kiev to the insurgents' call for a truce, but Ukrainian security officials said earlier Saturday that they had prevented armored Russian convoys from crossing into the separatist-held territory under the guise of a peacekeeping mission. Valeriy Chaliy, deputy chief of staff for Ukrainian President Petro Poroshenko, said Russia had attempted to send the purported assistance to its surrogates in the east late Friday night and intimated that the relief was being organized through the International Committee of the Red Cross. Chaliy said the Red Cross had denied involvement when contacted by Kiev officials. “Bearing in mind numerous violations by the Russian Federation of the state border regime of Ukraine and continued illegal supply of weapons, armored vehicles and mercenaries from Russia, Ukraine has solid grounds for concerns that the convoy may trigger further escalation,” the Ukrainian Foreign Ministry said in a statement. In Moscow, Kremlin spokesman Dmitry Peskov denied that Russia was attempting to provide military backing. “We have difficulty understanding what the Ukrainian side has in mind,” he said, according to the Russian news agency RIA Novosti. Peskov said the intensifying humanitarian crisis in eastern Ukraine was causing the “deepest concern” in Russia. U.S. Secretary of State John F. Kerry called Russian Foreign Minister Sergei Lavrov on Saturday to discuss the deteriorating situation in the separatist-held areas of eastern Ukraine, with their offices providing starkly contrasting accounts of the conversation. A senior State Department official said Kerry warned Lavrov against any attempts to send Russian personnel or assistance into Ukrainian territory without the consent and coordination of the Kiev government. Kerry “conveyed that Russia should not intervene in Ukraine under the guise of humanitarian convoys or any other pretext of ‘peacekeeping,’” the official said. Lavrov also talked with British Foreign Secretary Philip Hammond and informed him about Russia’s desire to get humanitarian assistance to those remaining in the embattled eastern cities. Pro-Russia militants spurned cease-fire calls from Kiev last month, including after the downing of a Malaysia Airlines passenger jet on July 17 in which all 298 on board were killed. The plane was hit by a surface-to-air missile fired from separatist-held territory by a sophisticated Buk launcher that Western intelligence says was delivered to the insurgents by Russia. 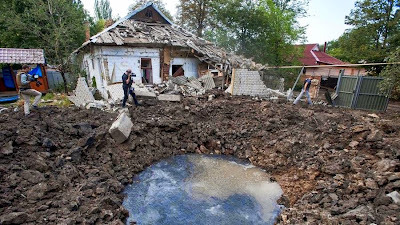 The debris and victims’ remains fell on separatist-controlled farmland, and international investigators have been thwarted by persistent fighting in their efforts to recover forensic evidence and human remains from the crash site. Fighting has intensified in the last month, with Ukrainian troops recovering control of more than half the territory seized by the militants in March and April, when the uprising against rule from Kiev was inspired by Russian President Vladimir Putin’s seizure and annexation of Ukraine’s Crimean peninsula. At least one person was killed and 18 wounded during shelling on Saturday that hit about 30 apartment blocks, said Maxim Rovinsky, a spokesman for the Donetsk leadership.